KEA Wet Filter Dust Collectors are units specifically designed for source capture where fine metal particulate is being produced. 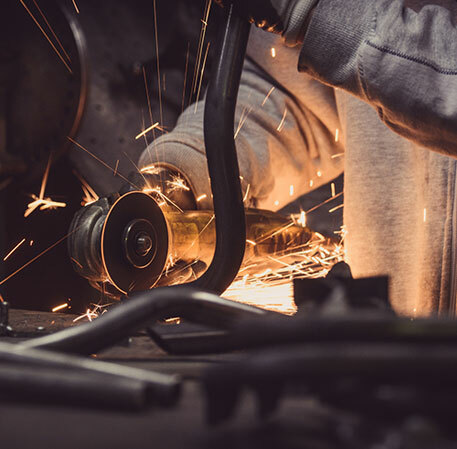 Metal working such as grinding, abrasive disc cutting, sawing, buffing and polishing may create clouds of fine dust. The risk of explosion increases as the metal dust gets finer and concentrations increase. 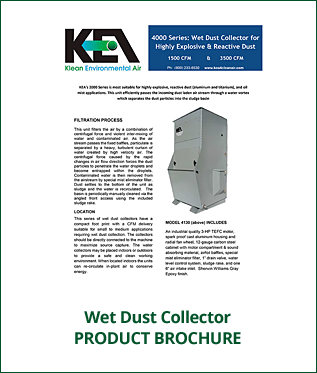 A wet dust collector is the preferred method for collecting and filtering such types of dust particulate. The wet dust collectors are a safe and economical method for capturing these potentially volatile materials. These units provide air volumes available at 1500 CFM and 3500 CFM in the work area. KEA WET Filter units purify air by a combination of centrifugal force and violent inter-mixing of water and contaminated air. As the air stream passes the fixed baffles, particulate is separated by a heavy, turbulent curtain of water created by high velocity air. The centrifugal force caused by the rapid changes in air flow direction forces the dust particles to penetrate the water droplets and become entrapped within the droplets. Contaminated water is then removed from the airstream by special mist filters. Dust, as sludge, settles to the bottom of the unit and the water is reused. An industrial quality motor, spark proof cast aluminum housing and radial fan wheel, 12-gauge carbon steel cabinet with insulated sound cover, airfoil baffles, special mist filters, 1” drain valve, water level control, sludge scoop, and one 6” inlet (may specify other options). Sherwin Williams Gray Epoxy finish. An industrial quality7 ½ HP TEFC motor, backward inclined radial steel fan wheel, 12- gauge carbon steel cabinet with motor compartment & sound absorbing material, airfoil baffles, special mist eliminator filter, 1” drain valve, water level control system, sludge rake, and two 8” air intake inlet. Sherwin Williams Gray Epoxy finish.